So now we have a working Quadcopter and camera and we can fly it. What we need is some good archaeology! During the year I’ve therefore opportunistically undertaken a series of experiments, which by lucky chance have been remarkably different situations. 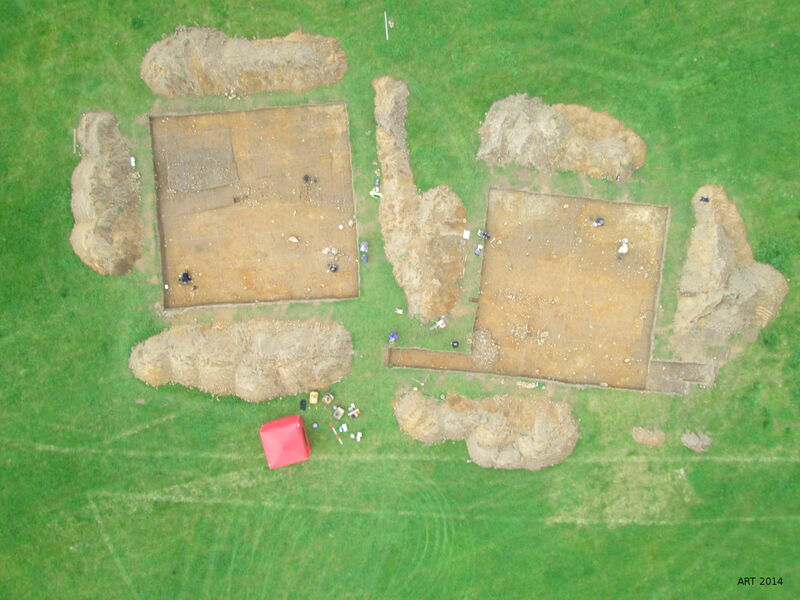 My first opportunity to fly over an active excavation was at Belladrum where Dr Fraser Hunter had opened up an extensive area (see our previous blog post on Belladrum Excavation 2014) . First I did a test flight over the site with people working. It was not easy to decide what height to fly at and so I tried what seemed like low/medium/high, and got some good pictures. When it was time for a coffee break I flew again and got some similar pictures (without people) before being rained off. These pictures are simply snaps from the air. They are more or less taken straight down, and are perspective shots, which is most obvious in the lower pictures. The higher pictures give a more plan-like view, but contain less detail (Note: all the pictures shown here have for practical reasons been compressed and so contain less detail than the originals). 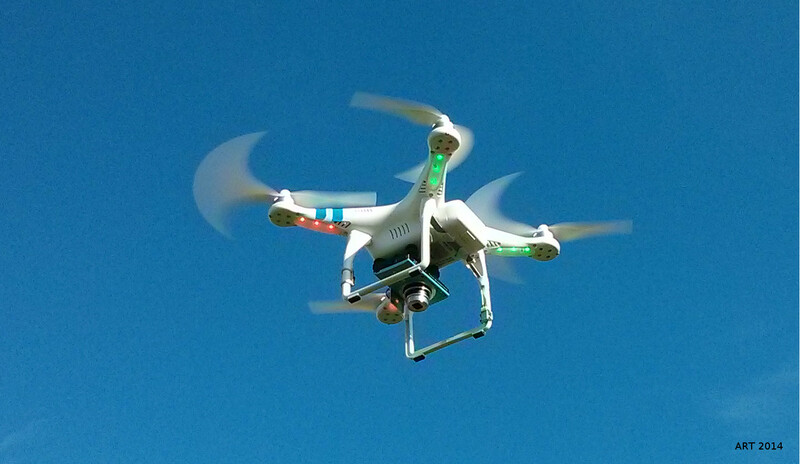 The battery life of the Quadcopter allows a flight up to about 20 minutes. Taking a picture every 7 seconds even for 12 minutes adds up to 100 pictures. After the two flights (the second somewhat curtailed) I had about 160 pictures to review. 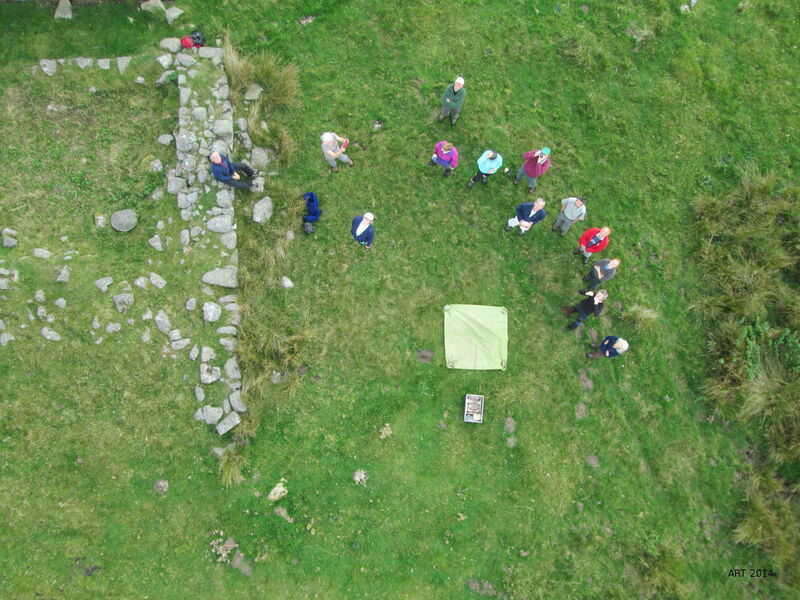 A surveying and plane tabling training day had been arranged with RCAHMS and a group mainly from NOSAS visited the site (see separate page – Banchor Township Survey 2014). Banchor is an interesting site because it contains (ruinous) standing buildings as well as the ‘humps and bumps’ left over from earlier structures. Because the group was on a surveying day my idea was to get a number of pictures and set them out like a plan of the site. 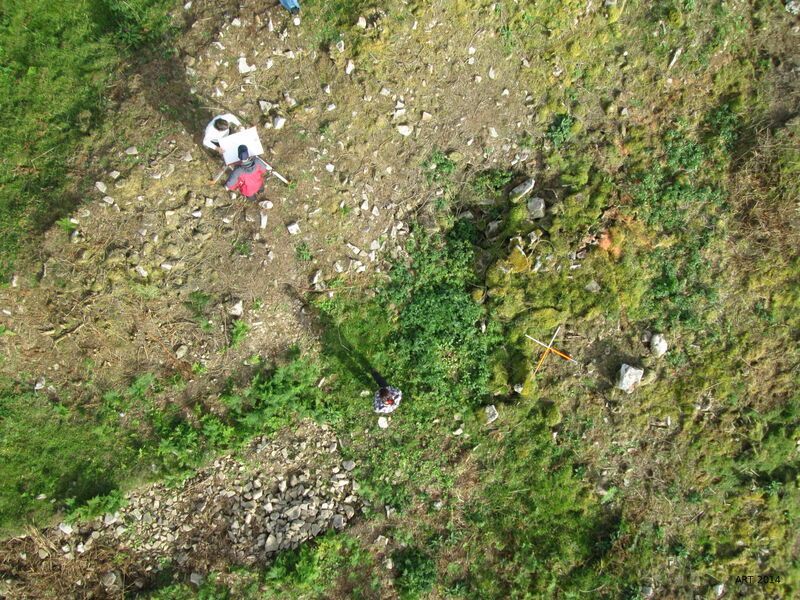 The first picture shows a typical view of the group looking up at the Quadcopter soon after take off. Note the sheet which is to protect the camera from wet grass, especially on landing. The second picture shows what seems like a straight down view over a building, from a low level. Although it looks like a plan, it isn’t exactly – if it were then the wall of the tin shed (assumed vertical!) would not be visible. Note also the plane table – there are quite a few in these pictures. The next picture is from a little higher and shows that not all pictures are even close to vertically downwards. In this case the Quadcopter may have been hovering and tilting to stay in position against the wind, or may have been travelling between stops. 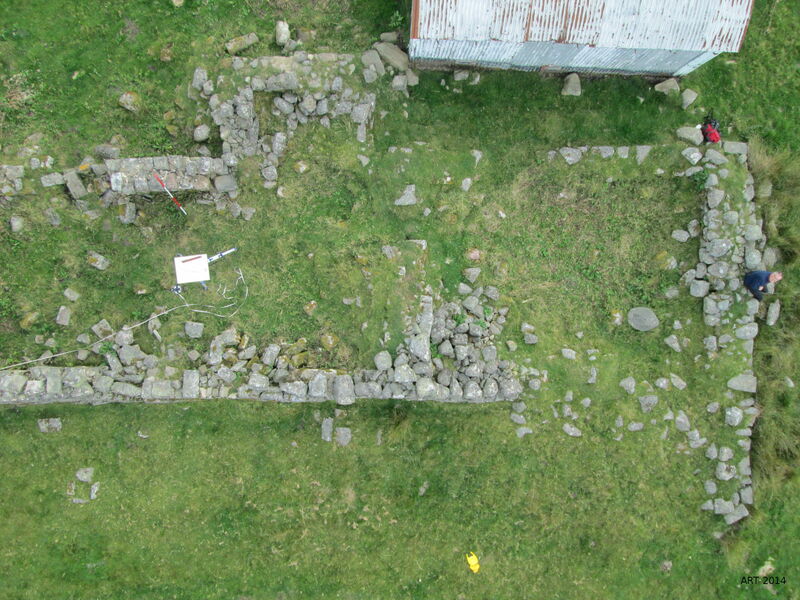 Note the corn-drying kiln and associated barn in the centre left of the picture, and the outline of an earlier building towards the bottom right. 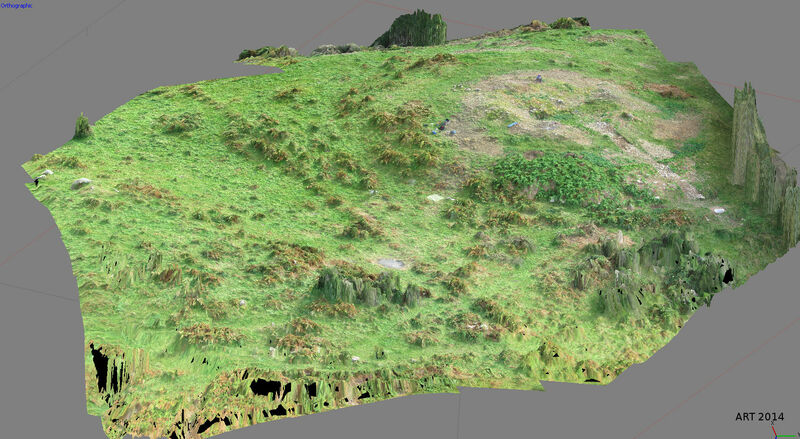 In order to bring all the pictures together I used photogrammetry to create a model of the 3D ground surface. The computer compares and matches up the overlapping images and works out where in 3D space the camera must have been when each picture was taken. 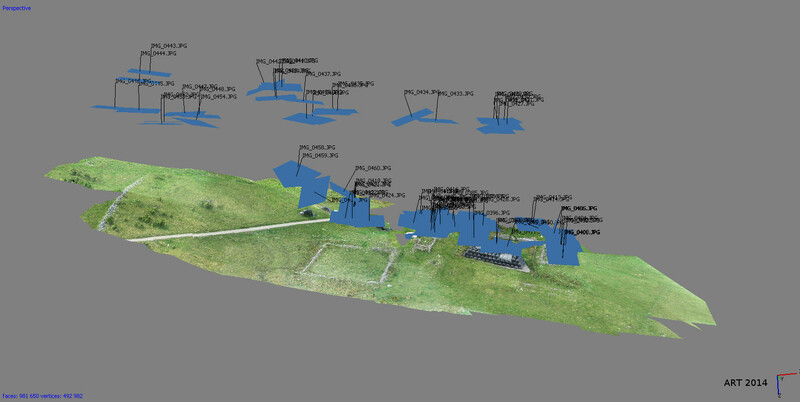 This image shows that stage, including a ‘point cloud’ of the ground surface. The computer then calculates and textures the surface in more detail. Because this is a model (ie just a set of numbers in the computer) it can be viewed from any direction, including from straight overhead as if a plan or map. The resulting picture can also be lit by the computer by setting the position of the ‘sun’ and letting the computer work out and display how the shadows would fall. Compare the two pictures below. 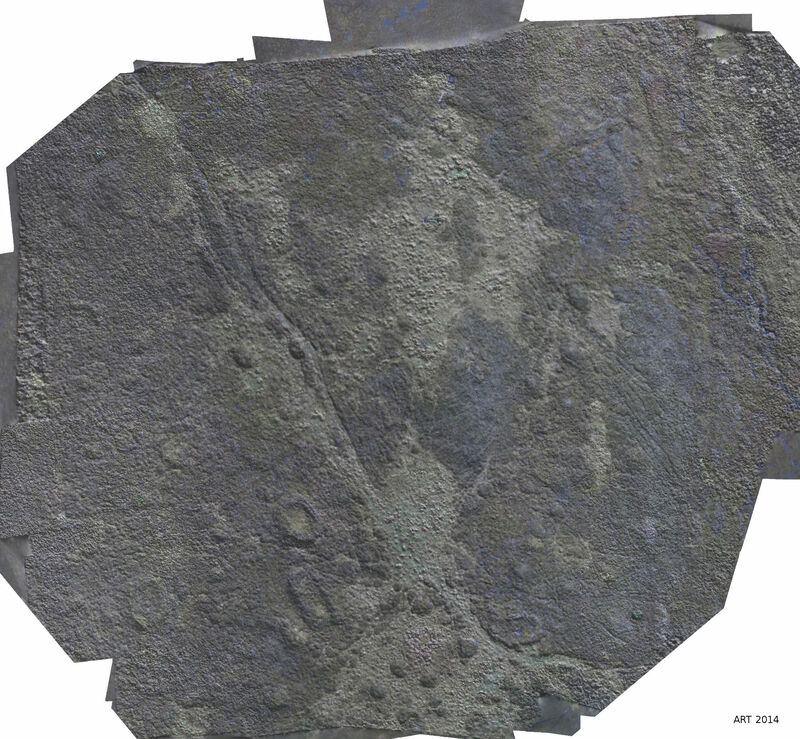 The first is the 3D image viewed from directly above, with the lighting as in the original photographs. The second has low angle sun and shadow applied by the computer. This comparison shows the advantage of a 3D model over a ‘flat’ image. 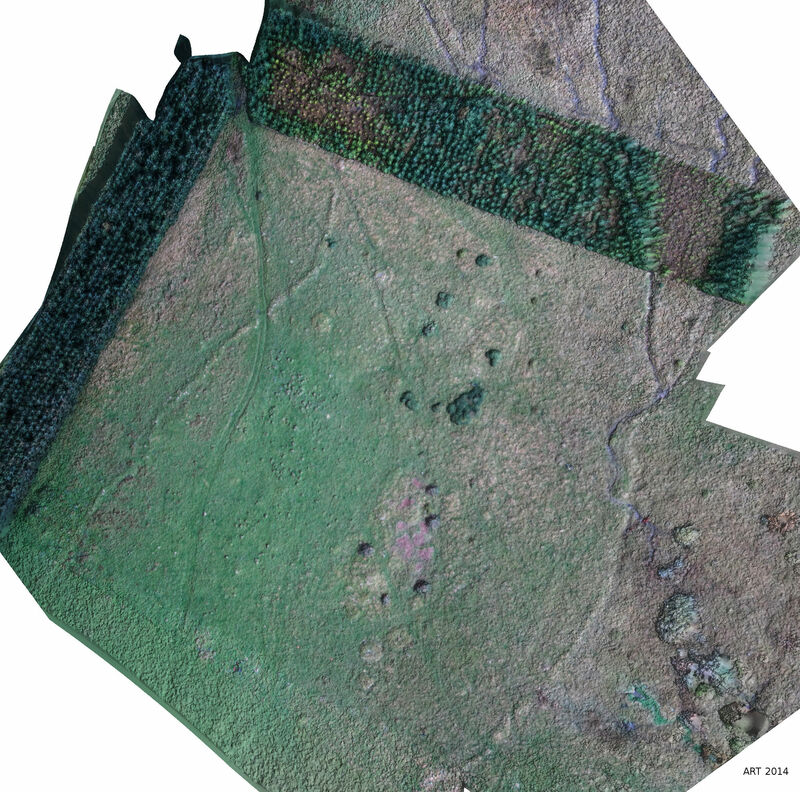 You can also see from the ‘point cloud’ that I flew low for a while and then more extensively and higher. Although this works well as an example of what can be done, it would have been better if I’d flown a bit higher and also covered the ground more logically, making sure I did not leave a gap in the middle. Most of the ‘great’ APs we see were taken when the lighting was just right. Using this method pictures can be taken on an ordinary day but still get the shadow effects which are so important. The method is most appropriate to the ‘humps and bumps’ type of site. 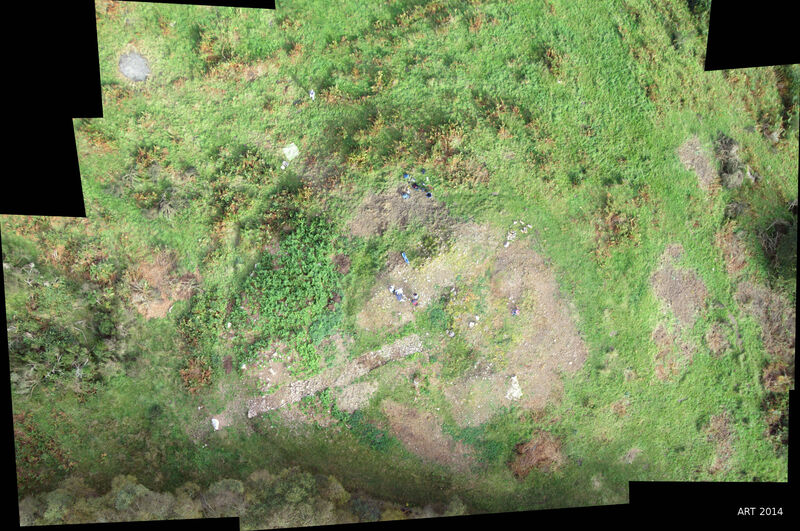 A NOSAS group had been clearing the bushes from the Dun at Scotsburn (see previous blog posts on the Scotsburn 2014 Excavation Part One and Part Two), and were keen to see if we could get some good APs. I visited the site on a very windy day, and I was uncertain whether it would be sensible to fly at all. In the event the wind died down a bit and I was able to take off from a sheltered spot, but once up high the Quadcopter was in the full wind. Because it has its own GPS and tries to hold its position, in windy conditions it rocks from side to side and so many of the pictures are not exactly straight down. I made one flight of about 12-15 minutes and captured over 110 images. The first picture is a simple image showing the others setting up the plane table. Although just a snapshot it shows the detail possible in a low altitude picture. 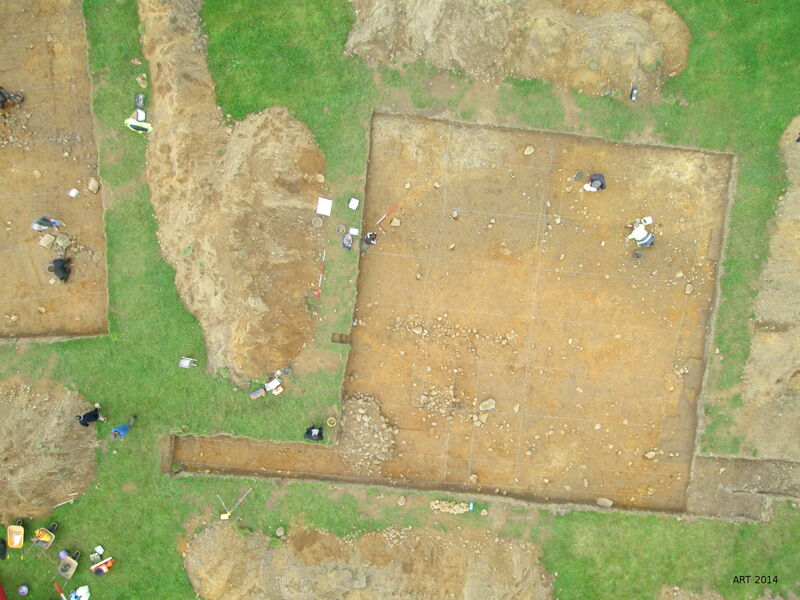 The ‘X’ marks the approximate centre of the Dun, and the end of the (filled in) trench excavated by Aberdeen University is visible at the bottom left. Flying higher would obviously cover a wider area, but with less detail. What I wanted to try here was to create a mosaic of images taken from lower, and hence including more detail. 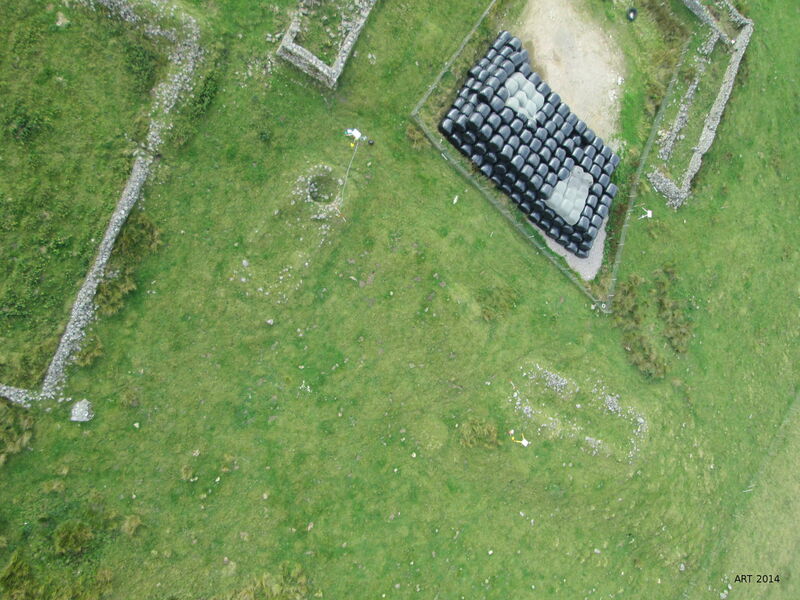 I therefore flew over the site at moderate height and tried to cover the ground in a logical grid. Even though I had flown at a reasonably constant height it was not possible to mosaic the pictures directly. This is because the pictures are never perfectly downward pointing (especially so given the wind that day) and so I had again to resort to photogrammetry to work out for each picture the height and direction of the camera. Then each picture can be corrected (rectified) and scaled and put together into a mosaic. The result is below. 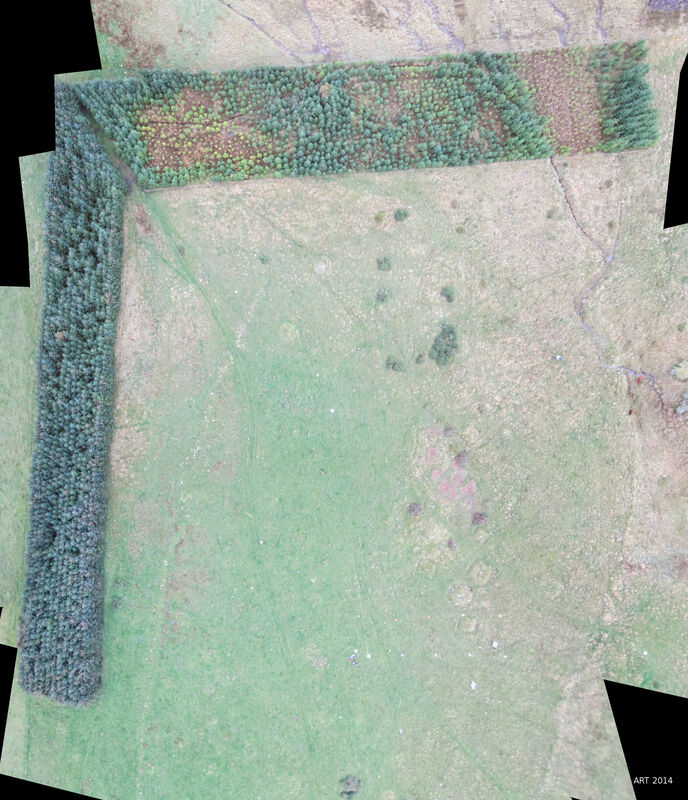 The picture shows the outline of the Dun; the areas of vegetation cleared by NOSAS members; where they had the fire (top left); the intrepid pilot (left of centre, top); and the outline of the Aberdeen University trench. At the bottom of the picture the ground drops away steeply and there are some large trees. 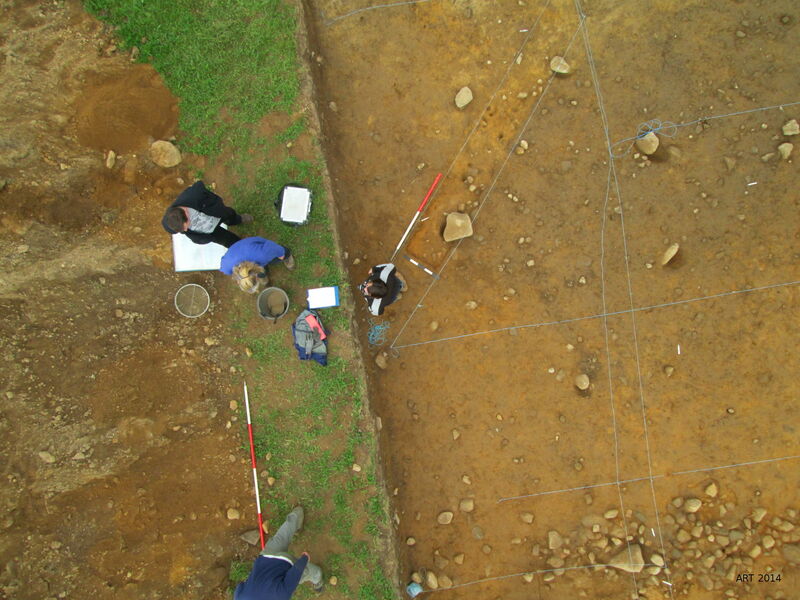 I then moved on to process the pictures into a 3D ground surface as at Banchor. The next picture is a general view of the area. Note that due to the wind the trees and bushes will have moved between pictures and so the computer cannot match them accurately, hence the somewhat blurry effects. The next pictures show the same model from directly above, firstly with original lighting, and secondly with extra computer generated low angle lighting. 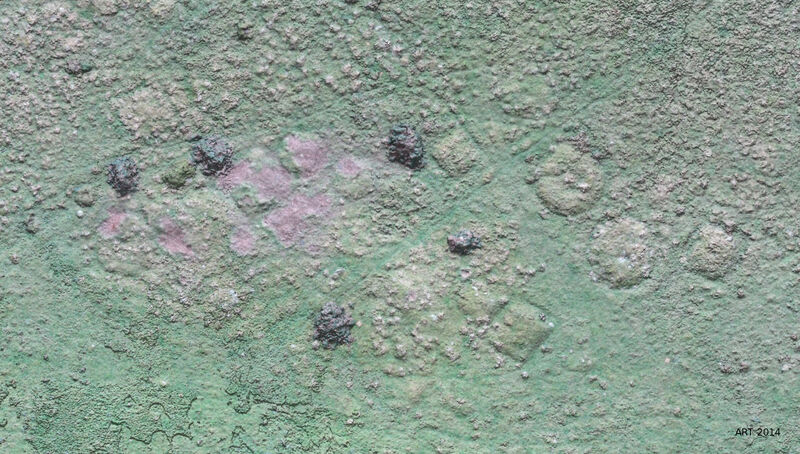 Some of the ditches around the Dun are picked out but the effects of vegetation are also emphasized – this is not Lidar! Finally for Scotsburn, this image shows simple contours being applied by the computer. Garbeg, near Drumnadrochit, is a great site and when I visited NOSAS members were starting to learn about QGIS and wanted images that we could place (scale and orientation) on a map. We therefore arrived at the site armed with ground markers (thanks to Richard and Bob). We placed the markers in what seemed like good locations and Bob took GPS readings for them all. First we flew at the Pictish cemetery (see our blog post). At this site I had already decided to fly higher than at Scotsburn. This picture shows a general (snapshot) view, looking downwards but generally towards the east. Some of the square and round barrows can be seen. 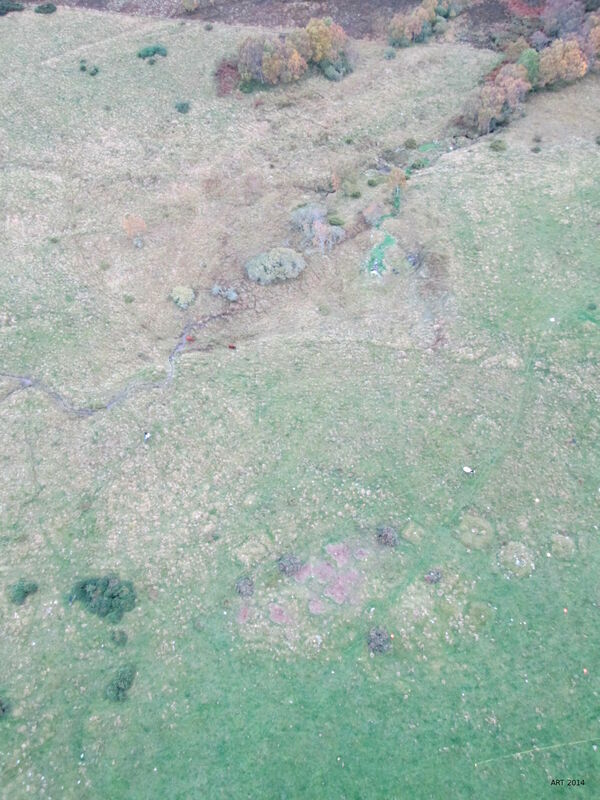 The pinker areas (bottom centre) are recently cleared ground and there are five heaps of cut pieces of vegetation waiting to be cleared from the site. There are also two reddish cows (just left of centre). More importantly, some of the markers are visible, especially at the bottom right. The next picture shows the set of images processed using the mosaic method to produce an orthographic image. And then the same area processed and lighted using the 3D surface method. Using the markers and GPS readings this image has also been georeferenced for use with QGIS, and is shown with north at the top. Just north of the cemetery is an area of moorland with a number of hut ‘circles’, most of which are not circular. It is not known whether these structures are associated with the cemetery. 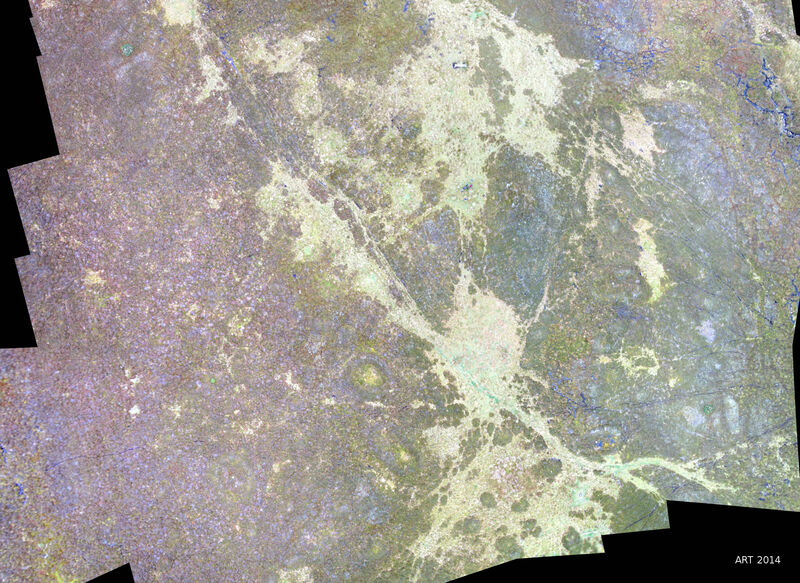 The first image is a wide area and is a rectified mosaic of many pictures. There are six structures although one is not easy to spot. Our group is standing on the higher ground north east of the centre of this image. I hope I have shown that aerial photography with a Quadcopter is not just a matter of flying up with a camera and taking a few snaps. Whilst it can be, in reality the type of pictures taken, the height flown, and the choice of post-processing depends very much on the type of site. When I started I thought that flying the Quadcopter and getting the pictures was the hard part. It can indeed be rather nerve-racking, but when it goes well it’s great fun. I now realise that processing the pictures is the real challenge. Processing a 3D model from 100 or more 16 megapixel images is not a trivial task and requires a very powerful PC and a lot of time! However once a 3D ground surface model has been created the options for presenting it are unlimited. I hope to fly (and learn) more in 2015. Thanks to all who have helped me especially Anne Cockroft, Jonie and Richard Guest, and Bob and Rosemary Jones. Thanks for that. Very useful and informative. What an interesting way to take aerial photos! Such a useful end product. I would be very interested in doing the same thing. I was wondering 1. What type of quadcopter you used? 2. What type of camera you used? 3. What type of software did you use to stitch the photos together and produce the 3D models? I would love to learn more about how you managed this and how I could reproduce for my own use.